Judy Cali and I channeled President John F. Kennedy and First Lady Jacqueline for a Thanksgiving Day message on our bright, beautiful future! 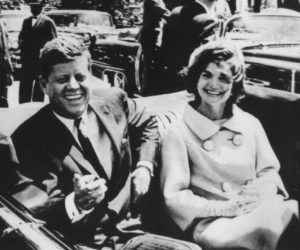 Judy Cali is one of America’s best psychics, and we are both very honored to have President Kennedy and the First Lady on my radio show. “My Fellow Americans, it has been 55 years since I was assassinated on November 22, 1963. However, I have never stopped being your President on the other side. I have been tirelessly working for peace – for example, the most recent peace agreement between Kim John Un and President Trump was achieved with my help, and I am continuing to work on bringing peace to this world. Planet Earth is headed for ascension into the 5th Dimension. The entire planet is now covered with many sparks of light, and soon the entire world will be a beautiful, bright white ball of love and light. You, your children, and future generations are destined to ascend into this beautiful new Dimension, and with it, will be the elimination of all poverty, of all war, of all conflict, of all disease, and true happiness will now bless mankind. If I had not been assassinated in 1963, this planet would now be in the 5th Dimension and we would now have a true paradise on Earth, with no war, no poverty, and no disease and abundance for everyone. We would also be exchanging Ambassadors with other advanced Extraterrestrial civilizations beyond this planet. The changes which I tried to implement from the top down, are now coming from the bottom up from all the beautiful people listening and reading this post today. You see, you are all very powerful and special spiritual beings – we are are all much, much stronger and more powerful than all the negative entities who are trying to stop your ascension and inevitable spiritual evolution. My Fellow Americans, and my fellow citizens of this world, I am with you today, and every day, and I have never left. I will never leave you. I will be helping all of you, and will be waiting for you when you ascend into the higher dimensions within the next few years. I know you will have many challenges, but please know that nothing will stop you from ascending into this beautiful New World of peace, harmony, and abundance!